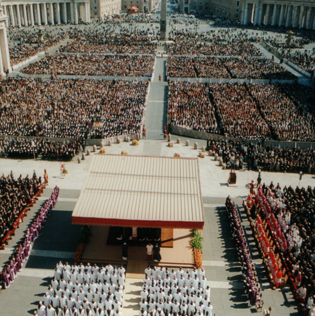 Blessed Maria Guadalupe, together with other martyrs from Valencia, was beatified on the morning of 11th March 2001 in St. Peter’s Square at the Vatican by Pope John Paul II.That evening, in the church of San Marcello al Corso in Rome, home of the General Curia of the Servite Order, an organ recital was given by Maestro Fra Francesco M. Rigobello, a Servite friar and professor at the Conservatory of Trent, as an expression of joy and thanksgiving for the beatification of the first Servite martyr. The day before, again in the church of San Marcello, all the Servite Family gathered for a Vigil of Prayer under the presidency of the Prior General, Fra Hubert M. Moons. During this, the Way of the Sorrowful Mother, the road of suffering trod by the Virgin Mary alongside the Passion of her Son, was celebrated. This devotion, a traditional act of Servite spirituality, was practised and meditated by Blessed Maria Guadalupe every day of her life until it became her own since, through her martyrdom, she was able to truly unite herself to the Sacrifice of the Son and his Mother. Cloistered nuns from across the Order were given special permission to be present at the beatification. Very many friars, sisters, lay members of the Order were also there, along with many members of the martyr’s family and pilgrims from Albal. The day following the ceremony, after a Eucharist of Thanksgiving in St. Peter’s Basilica with the Archbishop of Valencia, Mgr. Augustín García-Gasco Vicente presiding, the Holy Father urged all the pilgrims to follow the example of these martyrs.